We’ve all passed a formerly vacant lot, only to see it’s been seized and taken over by gardeners. There are rows of vegetables, maybe a few flowers and a sculpture of some sort. The sculpture in San Francisco’s Alemany Farm is a full-sized windmill. That should tell you everything you need to know about its agricultural girth. The farm, flanked at all sides by freeways, public housing or the slope of Bernal Heights, is carved out of a former junkyard. In the 1990s, the San Francisco League of Urban Gardeners transformed the 3 1/2 acre site into a sprawling garden with avocado trees, artichoke bushes and lavender shrubs. But the organization folded, the money ran out and the weeds reclaimed the site. 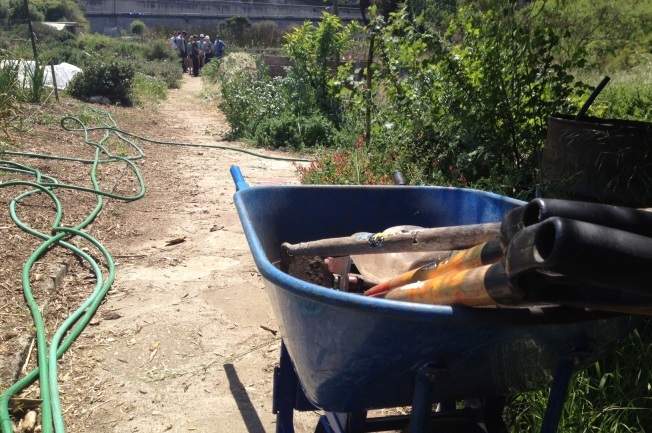 Several years ago, a new volunteer group called the Friends of the Alemany Garden took over the farm and whipped it back into shape -- in a rambling, English garden kind of way. The group hosts school groups, tourists and companies wanting to get their employees’ hands dirty while putting in some community service. On Earth Day, a group of volunteers from the Emeryville company Plum Organics pulled weeds at the farm, while others planted seeds as part of a company outing. Shirley Cornelius, who lives next door in the Alemany Public Housing Development, said the sprawling farm has become the backyard garden of the entire neighborhood. “Anybody from anywhere can come and harvest whatever they need,” said Cornelius, who remembered the lot when it was overgrown and filled with abandoned refrigerators. On a warm Monday, Red-winged Blackbirds flitted back and forth from the farm’s swampy pond to an olive tree. Artichokes perched on shrubs and tiny leaves concealed strawberries. Across from the farm, the din of three levels of freeway traffic buzzed incessantly, reminding visitors the farm was indeed in the midst of a city. Volunteer Brett Stephens scanned the landscape of trees and fennel plants, taking in the urbanized fauna.